California Livin Home: It's Garden Time! -*-*- Roger's Gardens! 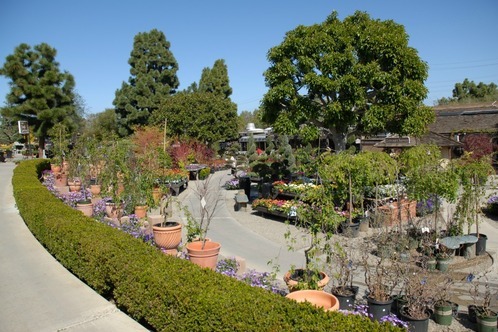 One place I could linger for hours here in Southern California (no, not the fabric shops) is Roger's Gardens in Corona del Mar. The entrance is always welcoming and the staff is exceptionally friendly. So many ways to go once you walk in. 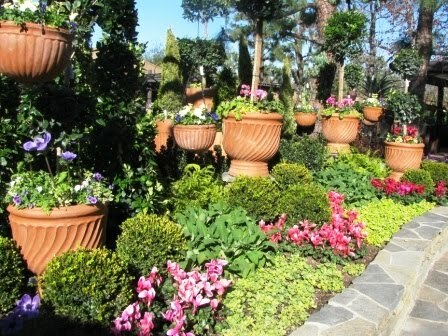 Take a stroll on the seven acre grounds and see all the blooms and foliage. Lush garden and indoor plants abound. The upper terrace is host to a wonderful assortment of high end outdoor furniture. My favorite area is the indoor gallery of home decor and accessories. Inside your eyes will delight to all things shiny. Come during the Christmas season and you will feel like a kid in a candy shop! Their Seasonal decorating is like cotton candy for the eyes. About 6-7 weeks prior to Christmas they close the home shop for a couple weeks to the public while their team of designers are secretly creating a magical Christmas wonderland of all things Santa. 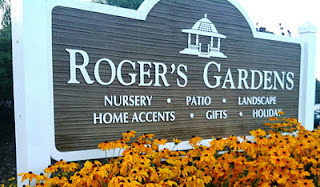 But don't wait until November to go to Roger's, their Halloween displays are simply spook-tacular! Open daily 9am - 6 pm.